Editor’s Note: Lauren Scarpati is a Pre-Doctoral Fellow at the Schaeffer Center, Dornsife Doctoral Fellow, PhD candidate in Economics, and was nominated and funded by the National Science Foundation to attend the Lindau Nobel Laureate Meeting in Economic Sciences in Lindau, Germany. 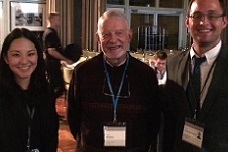 The Fifth Lindau Nobel Laureate Meeting in Economic Sciences was held in Lindau, Germany in August 2014. The Lindau Meeting in Economics is a week-long conference held every three years, which affords an international group of young scientists the opportunity to listen to lectures and interact with Nobel Laureates. Eighteen Laureates and four-hundred sixty young researchers attended; the United States contingent was comprised of twenty-nine young researchers representing a wide range of sub-disciplines within economics. The Lindau Meeting was invaluable to me as a young researcher: I was exposed to new ideas, shared my research findings, and connected with future collaborators. With the Schaeffer Center, I conduct research focused on the American healthcare system using Medicare claims data, investigating questions like whether Medicare Part D decreased racial/ethnic disparities in access to medication and whether any changes in health outcomes and utilization occurred due to the housing crisis. USC Presidential Professor in Health Economics and Nobel Laureate Daniel McFadden also represented USC and the Schaeffer Center. In a lecture entitled, “The New Science of Pleasure,” he discussed his work on better understanding how people make choices. Dr. McFadden also participated in a panel discussion on “The Future of Econometrics: Structural Restrictions, Parametric Methods and Big Data” with Laureates Christopher Sims and Lars Peter Hansen. This discussion was directly relevant to my research at the Schaeffer Center with large administrative datasets and gave me quite a few things to consider and incorporate into my work. Other Laureates spoke on the housing crisis and financial crisis, kidney exchanges, and a host of other topics. German Chancellor Angela Merkel gave the keynote address, emphasizing the importance of the bridge between economic science and policy and the role of economists in providing guidance for policy, something to which the Schaeffer Center contributes and values deeply. I thoroughly enjoyed discussing my work with other young researchers and hearing about the research questions that they were working to answer. I met young economists from India, Moldova, Guyana, Germany, and Sweden, among other places who provided interesting and unique perspectives. Some of these connections may even become collaborations – a new friend and colleague from Boston University and I may work together on a project looking at health outcomes among economically disadvantaged young Americans. In short, the Lindau Meeting was the experience of a lifetime!